Editor’s Note: This is an analysis of the latest revisions to the Center City Housing Incentive Policy (CCHIP), which the City Council has not yet discussed. The council is scheduled to discuss the changes you’re about to learn about on Dec. 12, and vote on them Dec. 13. 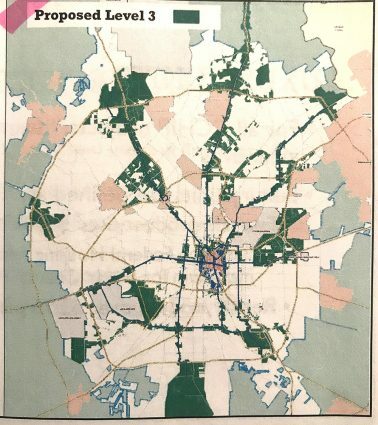 In a set of revisions meant to appease Mayor Ron Nirenberg’s concern about a lack of true affordable housing being produced, the downtown housing incentives policy, which is responsible for the flurry of new apartments in the center city in recent years, would also apply to the 13 regional nodes outlined in the SA Tomorrow Comprehensive Plan. And it would define, and exclude, a new category of housing: luxury. The latest changes to the policy, crafted by the Center City Development and Operations Department (CCDO), come almost exactly a year after Nirenberg placed a moratorium on the Center City Housing Incentive Policy (CCHIP), because he said it subsidized housing—mostly market-rate apartments—most San Antonians could not afford to live in. The City Council was scheduled to reinstate CCHIP in early October, but some council members and Nirenberg asked that the policy produce a deeper level of affordability from the units it produces. The more time CCDO works to meet the demands of the council, the more time community members are beginning to understand better CCHIP’s complexities, and some are beginning to pushback. Now, with other parts of San Antonio potentially affected by CCHIP, the debate about whether developers should be granted subsidies in exchange for a denser San Antonio, as well as some affordable housing, is sure to grow larger and larger. This is setting up to be a citywide issue. This is complicated stuff, so let’s walk through it together. From 2012 to Dec. 14 of last year, developers received a gift basket of incentives for building multifamily housing in the downtown area. This policy, aka CCHIP, is the main driver of all of the four- and five-story apartment buildings that have sprouted up in the Pearl area and in Southtown. By far the most lucrative incentive in the basket were rebates on city property taxes, which developers usually were granted for 15 years. The highest estimated rebate is $9.5 million over 15 years for The Arts Residences, 66 condos above a Thompson Hotel, currently under construction across the river from the Tobin Center for the Performing Arts. But most are worth a few million dollars. In the recommendations, developers would receive 75 percent of their city property taxes back, instead of 100 percent. They’d still have to pay all other taxing entities. San Antonians never discussed CCHIP much as a city, because it was downtown-centric, just pertaining to the very core and its abutting neighborhoods. But now CCDO is recommending developers receive rebates if they build in the comprehensive plans’ 13 regional centers. Besides downtown, those areas are the Medical Center, Midtown (includes the Pearl), Brooks, Texas A&M-San Antonio, University of Texas at San Antonio, Stone Oak, Highway 151-Loop 1604, the greater airport area, northeast I-35-Loop 410, Rolling Oaks, Fort Sam Houston and Lackland AFB-Port San Antonio. These regions would only be eligible after the City Council adopts their future land-use plans, according to an outline of the new policy, which was shared at a meeting with community members on Tuesday, and obtained by the Heron. The city is also recommending that multifamily luxury developments be ineligible for CCHIP incentives. It defines luxury as condos priced at more than $360,000 (based on the Federal Housing Administration’s mortgage loan maximum for Bexar County) and apartments rents at more than $2.75 a square foot. 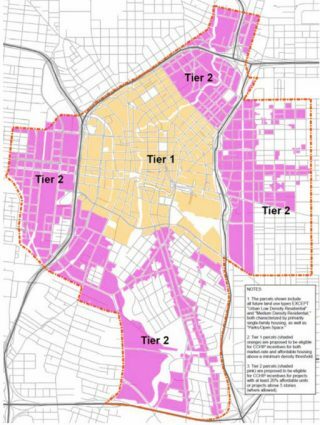 The new CCHIP—which the City Council is scheduled to discuss Dec. 12 and vote on Dec. 13—delineates three levels, or tiers as they’re shown on this map, eligible for incentives. Level 1 is defined roughly as downtown proper, or the 2.64 square miles of the core itself. Level 2 consists of properties that directly surround downtown—such as the Pearl, the near West Side, the near East Side, and parts of the near South Side. Level 3, the latest addition, is the 13 regional centers shown on the map above. » Level 1: 75 percent city property tax rebate for 15 years. No luxury. » Level 2: 75 percent city property tax rebate for 10 years. Must include 20 percent affordable units (10 percent reserved for households making 80 percent or below of the area median income [AMI] and 10 percent at 60 percent or below AMI) or build above five stories in height—or both. No luxury. » Level 3: 75 percent city property tax rebate for 10 years. Must also include 20 percent affordable units for households making 60 percent AMI, or below. The other 25 percent of the city property tax revenue would feed into an affordable housing fund, which city officials expect to yield $1.1 million through 2020. The fund’s use has not been determined. Besides the tax rebates, CCHIP also includes waivers on city development and SAWS impact fees. Projects in Level 1—again, strictly downtown—are also eligible for a infrastructure grant—to pay for project-related upgrades such as sidewalks, utilities, etc.—which offer $10,000 per affordable unit up to 50 units. But this only applies to projects in which the developer includes at least 10 percent affordable units. Also, projects that include hotel rooms would not be eligible for CCHIP incentives. As per District 4 Councilman Rey Saldaña’s request, the new policy also outlines some goals. The city is setting a 10-year goal of 12,382 affordable units, which it defines as being available to households making 80 percent or less AMI, for the three levels combined. The bulk of those units—7,613—would be built in the regional centers and priced between 30-60 percent AMI. In 2016, an estimated 165,000 San Antonio households spent more than 30 percent on their incomes on housing, and are therefore considered cost-burdened, the Mayor’s Housing Task Force concluded in its August 2018 housing report. It estimates there are 36,900 cost-burdened households who make less than 30 percent AMI, or $14,780—the lowest of the low-income. I’m still gathering reaction from community members, and I should have that story published later today. Yesterday, I placed an interview request with CCDO about the latest CCHIP recommendations, but the request wasn’t granted. I can tell you that some City Council members are concerned about the CCHIP changes, and that some communities beyond downtown are beginning to catch wind of the revisions, and are pushing back as I type this Wednesday morning. Members of the Mayor’s Housing Policy Task Force are also making their concerns known to the council. Again, that story later today. CCHIP also has plenty of supporters, besides developers. During a B session a few weeks ago—before the 13 regional centers were introduced as a possibility for incentives—a handful of council members, and Nirenberg, criticized that versionof CCHIP, saying it still lacked the right mix of affordable units. But the majority of council members, judging from their comments and/or voting records, were fine with the changes. Through 2012 and 2017, CCHIP has been credited with the surge of apartment developments—with some condos—in the downtown area. City officials say the program was never meant as an affordable housing tool. Instead, it was meant as an economic generator, and to meet the downtown housing demand they say is proven by companies such as USAA, Credit Human and Jefferson Bank moving offices and, in some cases, headquarters, to the downtown area. CCHIP has worked, having produced or spurred the creation of 6,810 units (on its way of surpassing its goal of 7,500 by 2020), 230,000 square feet of retail space, and 28,000 square feet of office space. The city’s presentation doesn’t say how many hotel rooms were aided. However, the majority of the new housing has been on downtown’s outskirts, where land prices are cheaper, and that’s why the revisions suggest less restrictions—such as no affordability requirement—in the core. Overall, $102 million in CCHIP incentives have been doled out to the developers of 64 projects, which the city estimates a yield of $1.4 billion in private investment—meaning that’s how much private equity is being spent to build all of these structures, and related public upgrades. 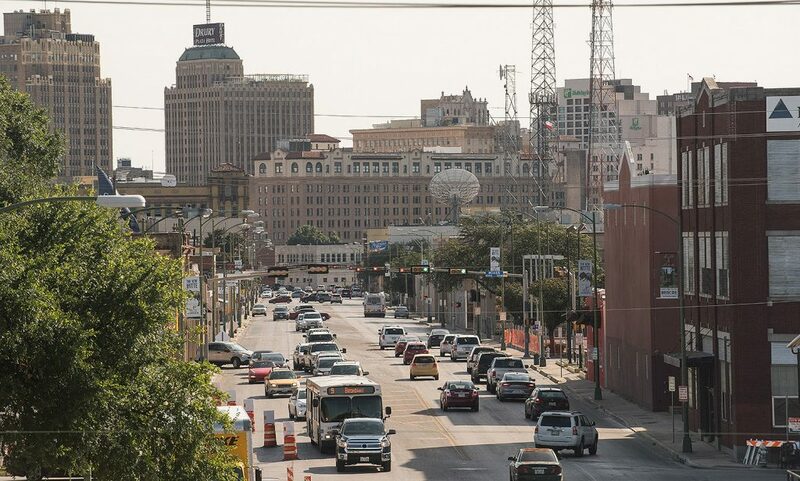 City officials say another taxing entities benefit—such as Bexar County, the San Antonio Independent School District, VIA Metropolitan Transit, etc.—by the rise in value of the properties on which these developments are built. They say that if you took the 64 CCHIP projects, assuming they were all built in 2017, and looked at the first year after the 15-year tax rebate ended (or, the 16th year) the owners of the developments would pay $10.1 in city property taxes. Using that same metric, the land owners would pay $39.8 million to other taxing entities. If those properties were undeveloped, city officials say, they would produce $349,164 in property taxes to the city, and $1.3 million to the other entities, in the same time frame. That’s all well and good, some critics, such as Nirenberg, have said, but it was still producing apartments that many San Antonians can’t afford. The 120 Ninth Street apartments, which are nearly open on the Museum Reach portion of the river, offer apartments starting at $1,300. Its CCHIP package is worth an estimated $3.9 million. There is much more to be written about San Antonio’s housing incentives debate. This seems like an appropriate place to stop for now. Again, I’ll have reaction to these latest changes later today, and much more CCHIP stories planned that explain other aspects of the policy in the next few weeks. By the way, the city is recommending extending CCHIP for two years, and re-evaluating it at that time. These developers who often have name changes but are all under the same umbrella, need to be reviewed and re-evaluated for these tax incentatives. Most have not produced or housed the qualified tenants but rather change the market rate they control within the community. Streets and sidewalks leading to these developments are still in deplorable conditions, so the walkability standards the city is touting is non existent around these multimillion developments. City has failed the neighborhood and legacy property tax payer in favor of these traveling salesmen. Set up the wagon, give the city a show and sell us a watered down, inferior product. All sounds good but I have no idea. Ehh flip a coin. Heads you change it tail you don’t. $2.75 rents per square foot are still 95% of the market rate apartments. The only one at $3 is cellars at the pearl. Same show different circus.